Adam Klein was instead revealed to be the winner of its $1 million grand prize on Wednesday night's two-hour CBS broadcast. Hannah, a 24-year-old barista from West Hollywood, CA, and Ken, a 33-year-old model from Denver, CO, both received zero votes to win in the season's final jury voting results. During an exclusive interview with Reality TV World on Thursday, Hannah talked about her Survivor loss and overall experience. Below is the first half. Check back with us soon for more. Reality TV World: Are you surprised you didn't receive at least one jury vote to win? You were accused of flipping a lot, but the jury claimed they weren't bitter. So do you believe them? Hannah Shapiro: Listen, I don't think I was surprised, I mean, for a few reasons. I think that it was clear to me that I underestimated the power of perception. I really felt like I was playing a smart, strategic game, but I had to lead with being the more goofy, quirky sides of my personality. And I think Survivor is such a tricky game, you know, it's a fine line between showing your cards and articulating what you're doing versus hiding them so you don't get your torch snuffed. And so, I think that -- I could feel that the jury did not see my game clearly. I felt like I fought hard and argued for it, but the other thing is, our cast is incredibly close, which is an amazing thing. But there's also such a one-groove mind mentality of the jury, and I think if any season was going to have a unanimous vote, [it would be ours] because the cast was incredibly close and almost discussed deciding to vote together. Reality TV World: So what did you think your chances were of winning before and then after the jury questioning? Hannah Shapiro: Well, I definitely, after the full Final Tribal Council, knew that Adam had won the game. I went into Final Tribal really believing that I had a fair argument for why I deserved to win the game. I was in control of a lot of the game and I think my trouble was that I don't think people saw or understood that as fully as I wanted or as I might have hoped. But I was not going to sit at the end unless I felt like I had played a strong game that I could stand by and say, "This is why I deserve your vote." Reality TV World: How big of an impact do you think Adam's disclosure of his mom's cancer battle in his closing jury comments had on the jury vote? And I was like, "No!" I love Adam dearly. He's like a brother to me, and you know, I had no idea what Adam was fighting for out there. I think Adam told the people -- he very purposely didn't want me to know the reasons he was fighting out there. And yeah, I think Adam is a very smart and deserving winner. 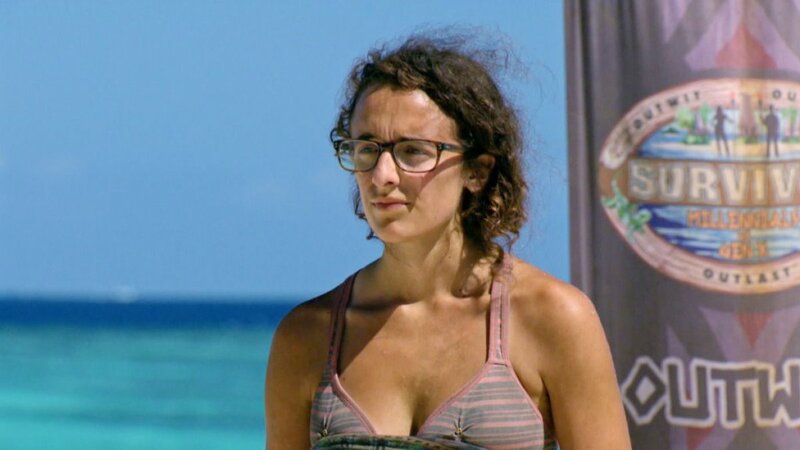 Hannah Shapiro: Someone like Chris, [Jessica Lewis] is a strong, smart woman, and you saw how that was treated in a post-mostly male merge. I had to lead with being goofy and silly, and I think someone like Chris viewed me as just being a goofball. But I think in reality I was much more smart and strategic than he realized. But Adam had a little bit more leniency to, like, lead with being smart and strategic. So once it came down to it, and you don't have a receipt, you can't roll back the tape and show something. It's clear why Chris was going to believe what he was going to believe. Reality TV World: Chris said Adam convinced Ken to vote out David Wright, but it appeared you did all the work. Any idea how Chris came to that conclusion? Hannah Shapiro: Yeah! I had been working on Ken for, oh my goodness, so long. I knew I couldn't just turn against and get David out. I knew I couldn't sit at the end with him because Ken would never forgive me, and Ken would go on these hour-long rambles about loyalty and all of this stuff. So for weeks, I had been working on Ken. And there was even a moment -- like, days before me trying to convince him -- where Ken said, "You know, Dave didn't tell me about his fake idol. Does he not trust me?" And I said, "I don't know!" I was planting seeds for a while. And then that final push to be like, "Look, Ken, look at the jury. Look what's happening." And I was able to convince him too because of the relationship I had built. But again, perception is everything. Reality TV World: You seemed frustrated Adam was taking credit for some of your moves. Any ones in particular that bothered you? Hannah Shapiro: Well, it was just funny. It was like Adam wanted to take credit for the moves I had made that were popular and sort of wanted to push the unpopular decisions back onto me. There wasn't a specific move. I just think I wasn't going to sit at the end and let someone claim they did the things that I did. So, I was going to hold my own, and Adam and I are both passionate, competitive people. And neither of us were going to go down without a fight. It was a lovely fight! But we were going to fight. Check back with Reality TV World soon for the concluding portion of our exclusive Survivor interview with Hannah Shapiro.